i hope im not too late but i cant use dummy core with buffed tools could you plz fix it? Не можешь подсказать, для чего DummyCore на 1.8? Is there a way to get sponge and dummycore to play nicely with each other? I noticed that your mod causes 2 problems. The first is that it prevents the music from the menu to be played, and it happened sometimes that all the music of Minecraft in general doesn't play them more, while the other sounds work fine. The another bug is when the mod Aether is installed. If you know this mod, it adds a 2nd menu and there is two buttons for switching between the classic menu and aether menu. When your mod is installed, the two buttons disaspears and we can't switch more to the aether menu. How i can create a custom main menu with DC for my mod pack? Just to let you know, this and Rei's Minimap don't work well together. When I add DummyCore I lose the minimap, even the overlay option where it covers the screen. If there's some way to resolve this I hope we can find it because I really like both EC and Rei's. I've done some researching and it seems like the mod is not being updated to 1.7.10 by the original author, and there is no legal version. I will not patch DC for unofficial illegal version. Also, the problem is most likely not on DC's side since DC does nothing to MC's render code and to minimaps. Sure, anyone can use mods made by DT in any knid of modpack. 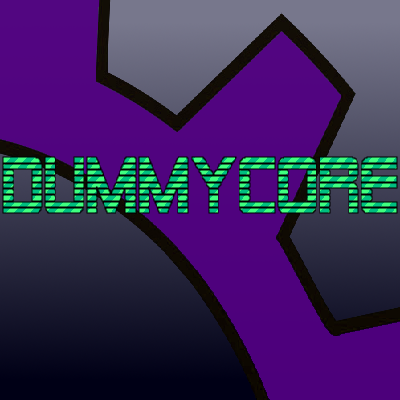 [1.8.8]DummyCore-2.1.188.7(will not work for 1.8)! !